New Products and My Recent "Doodles!" We have quite a few more new products available in the shop now! 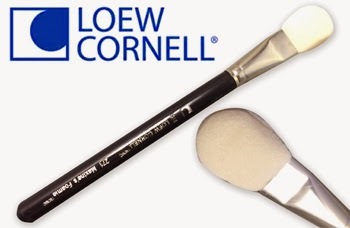 In my process of gradually replacing all of my Kryolan brand products, I am phasing in some fantastic new brushes from Loew-Cornell, as well as a growing assortment of palette refills for both Paradise and Wolfe palettes. 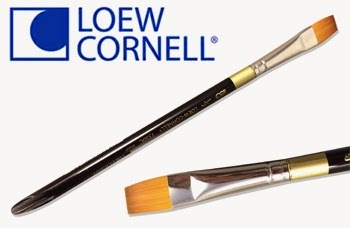 This new brush shown below is one of the specialty shaped brushes, in the same line as Loew-Cornell's Flora and double filbert brushes. This "Flora Round" brush is designed specifically for creating teardrops and double-dip petal shapes! At first glance it looks like a typical round brush, but the point of it does extend out longer and more narrow, allowing you to paint a nice, crisp point. I hope to play with mine this week and post some photos of what it can do. Above is our new 1/2" Loew-Cornell flat brush. 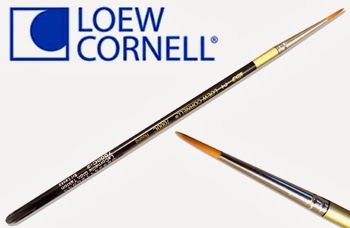 I use my 1/2" flat brushes frequently when painting with one-stroke cakes, when I want to only pick up a couple of the colors in a split cake. 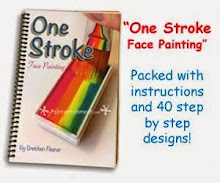 My new One Stroke Face Painting Book (which I've just re-stocked as well!) shows many designs that use this brush to pick up 2-3 colors. 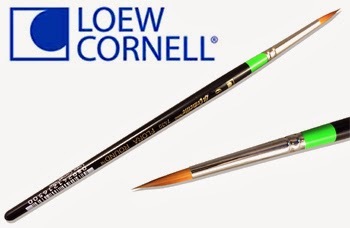 Below are photos of the Loew-Cornell round brushes we are now carrying, in a #2, #3, and #5. Their golden taklon fibers are durable and precise. The handles on these brushes below, and the two brushes above, are made of a smoky gray acrylic, which helps them hold up well to moisture. I've also now added Loew-Cornell's "Maxine's Foamie" foam applicators! The foam heads on these are about 3/4" in diameter, and the handle is made of wood. Be sure to check out our full line of brushes and sponges! 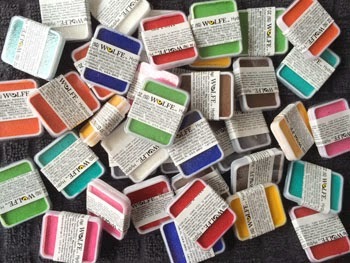 In addition to the brushes, we're now carrying Wolfe Appetizer palette refills, and have added refill sizes of Paradise's very popular "Brilliant" line of metallic paints. Unfortunately my shipment from Wolfe was missing the black and purple refills, so I should be getting those in soon! 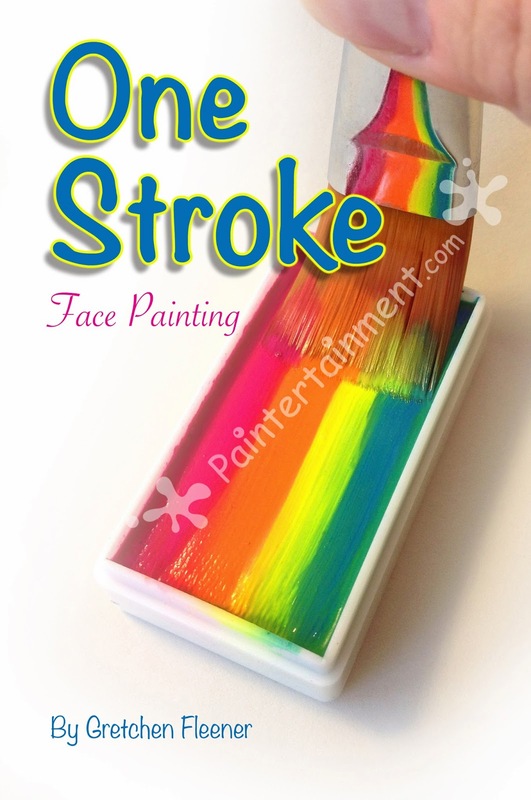 "One Stroke Face Painting" NOW SHIPPING! I have been so humbled and overwhelmed by your response to my new book, "One Stroke Face Painting" ...I have been so busy shipping orders and answering messages about it, that I am just now (2 days later) blogging about it's release! I've already sold 25% of my stock, and have a feeling I'll be printing more soon! For those of you who are interested in this new book, I wanted to post some more photos of it. I know how hard it can be to buy things online when you can't touch, hold, and feel them, so I always try to include lots of photos! This is a nice, thick book! 3/8" to be exact... And the spiral binding allows it to lay flat on your table while you work. 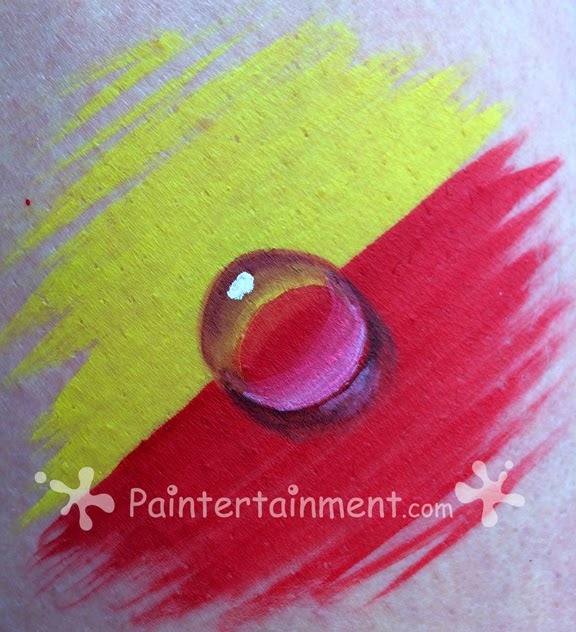 One design from the "cheek art" section. This is also great around arms! 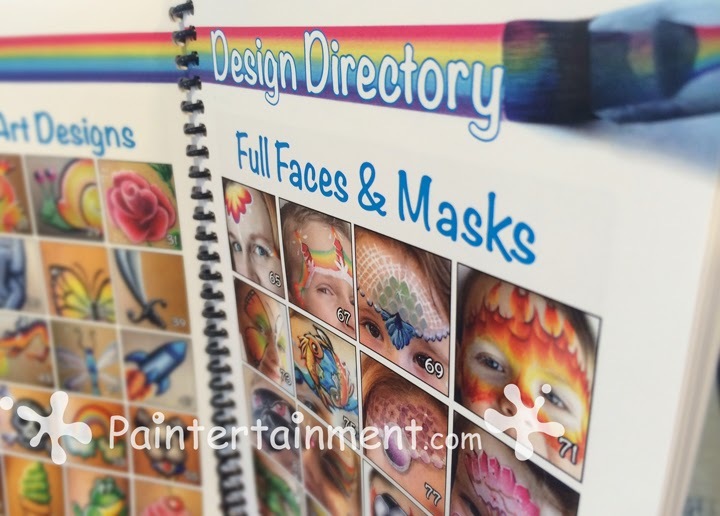 There is an illustrated "design directory" on page 23, which makes it easy for you to browse all 40 designs and immediately know what page they are on. 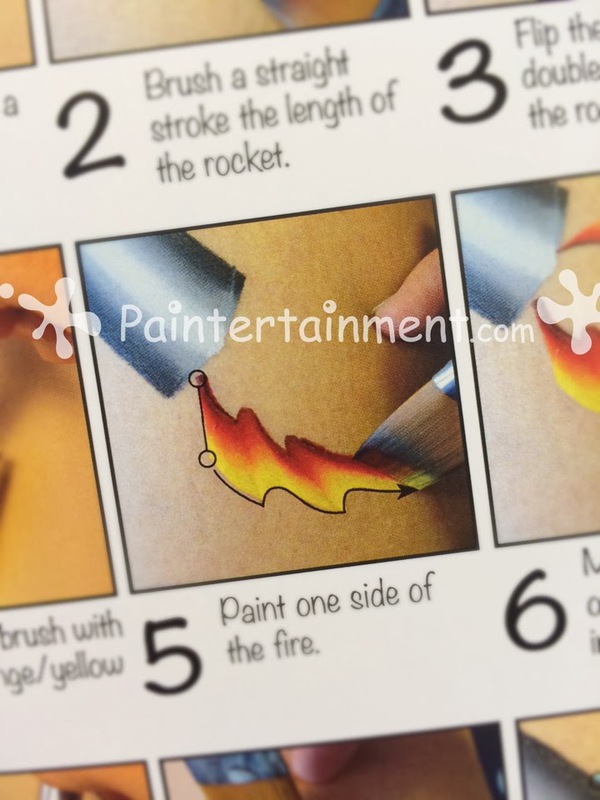 Many of the designs have these graphics to help you know where to position your brush, and in what direction to move it to get the desired effect. 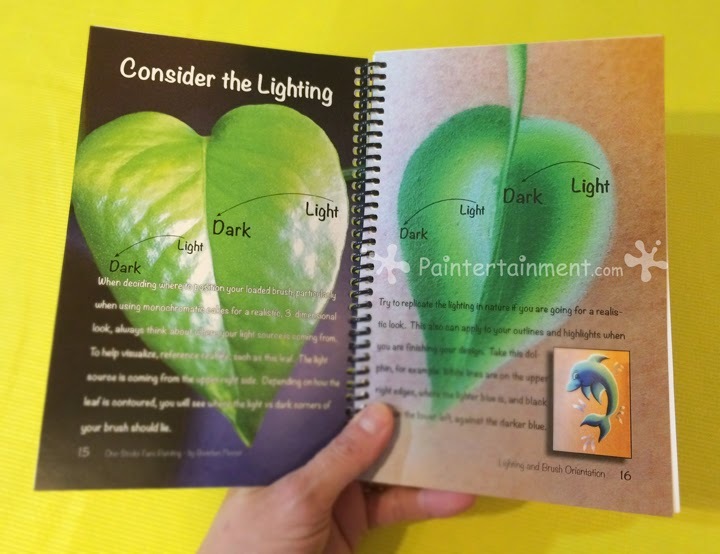 I have one spread that touches on lighting, and how to position your colors for the most realistic 3-D effects. Honestly, I could write an entire book on lighting and shadows...and I just might in the future. As an Industrial Design major in college, I took entire courses focused on realistically drawing objects. 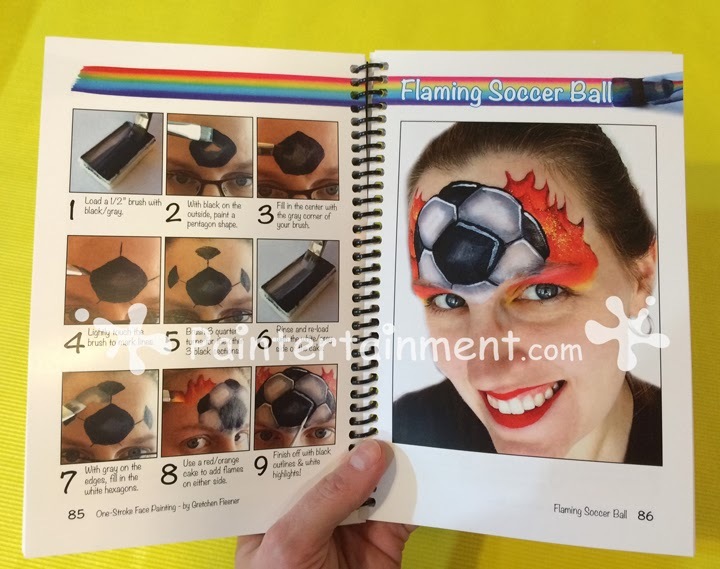 One of my full-face designs...the popular flaming soccer ball taken to a whole new level! I hope this helps you get a better feel for what this book contains and how it is laid out! Please note that if you are ordering in the US, and you order only this one book, the shipping will actually be about $6, not the $9 that the website calculates. So, if you only order the book, I will refund you for any difference in the actual costs. For those interested in ordering outside the US, the shipping varies. Please email me at Gretchen(at)Paintertainment(dot)com with your country/address and I will let you know your country's shipping and send a Paypal invoice if you'd like to order! Have you already purchased a copy? If so, I'd LOVE to hear your thoughts and reviews! Please feel free to post as a comment here, or email me at Gretchen(at)Paintertainment(dot)com. Thank you so much for your support of my new book!! Happy painting!! It's GARAGE SALE Season at Paintertainment! Who's ready for GARAGE SALE season?! We are! I love garage sales and I frequently find things that I can use in my kit or my business at garage sales. 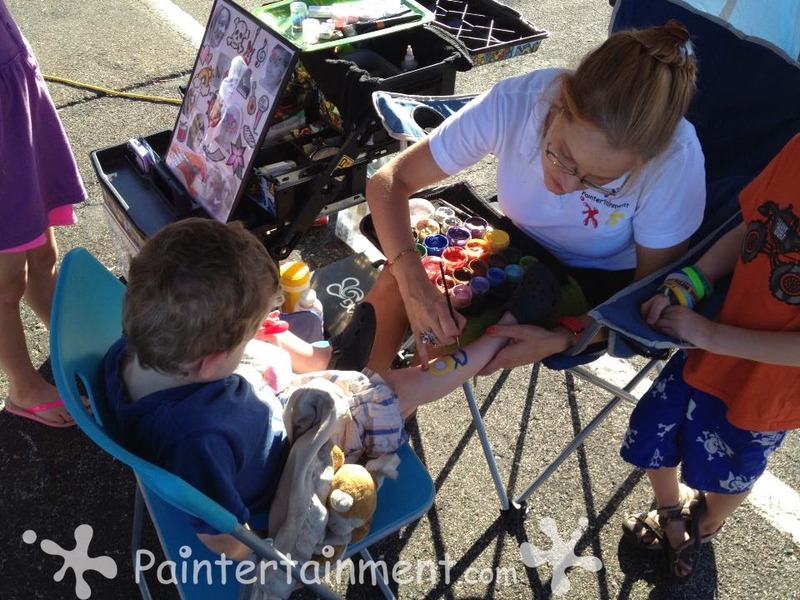 Wouldn't it be cool to find a garage sale with stuff specifically for face painters?! We have just opened up a new garage sale section of our website! Yes, we still have our usual fabulous clearance section, which is full of brand new, unopened items at great discounts. However, our new garage sale section is where you will find gently used items, slightly damaged items, and even a few brand new items that have never been used! Sometimes I'll end up with a cake of paint that has a cracked lid, a book with bent corners, or a product without a package. These items are perfectly useable, but not quite like brand new, and I need to get them out of my shop, which means great deals for you! Also, if I happen to find something perfect for face painters at actual garage sales in my area, this is where I'll post them to pass on the bargains to someone who can use them. Check it out today and see what you might find, and be sure to check back often as it can change at any moment! Happy bargain hunting! 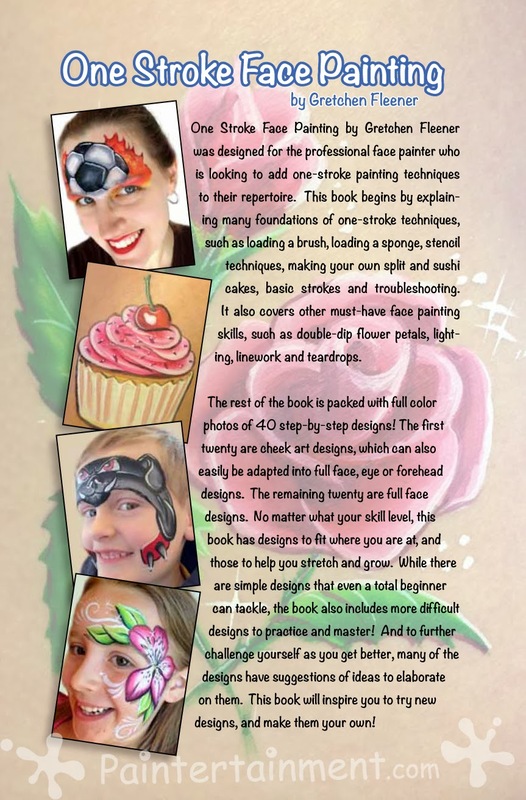 PRE-ORDER our New Book: One Stroke Face Painting! 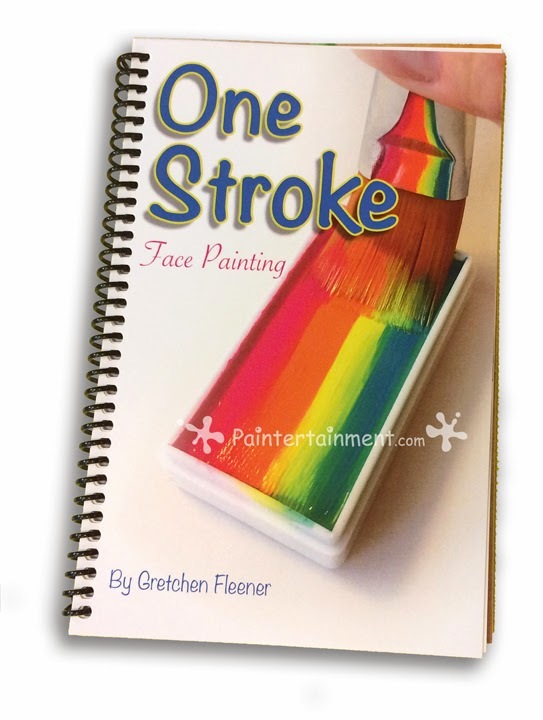 I'm super excited to announce that my new book, "One Stroke Face Painting," is at the printers as I write this, and is PRE-ORDERING IS NOW AVAILABLE! It should be complete on Tuesday...which means I hope to have it in my hands on Tuesday or Wednesday, depending on what time of day it is ready for pick-up. This book will measure 5.5" x 8.5", and will have a coil binding. 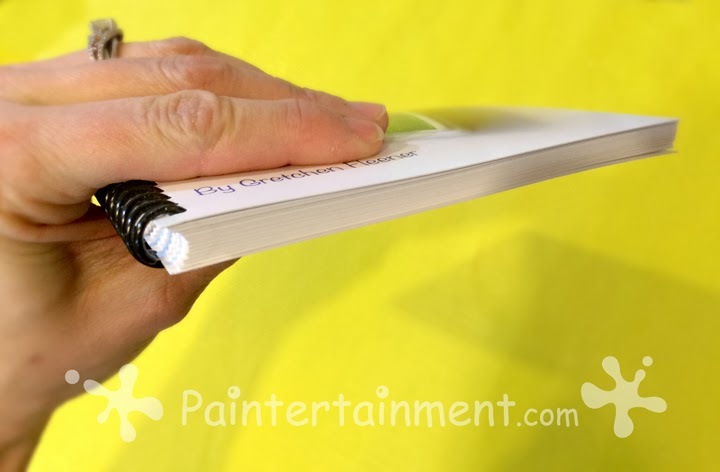 This enables you to lay the book flat on the table while you're working on the designs! 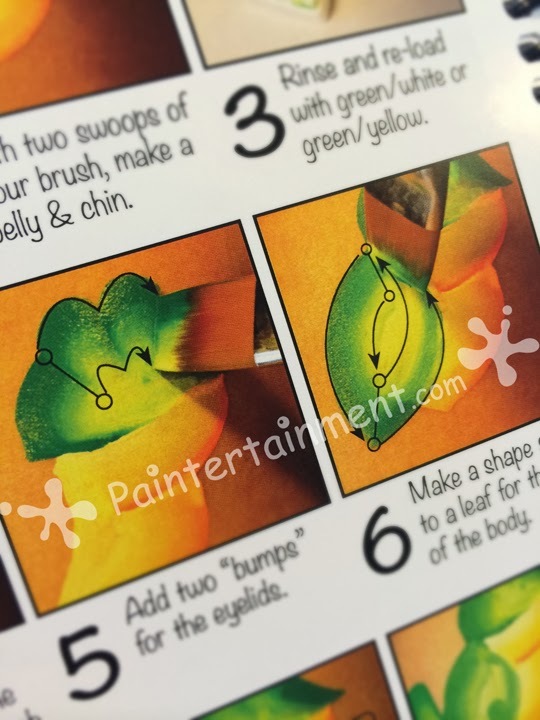 There are 40 step-by-step designs in the book...half of them are cheek art and the other half are full faces. I went to great lengths to ensure that every page has COLOR! I know that we artists are visual people, and a photo or even a text page without color is...well...a missed opportunity. So, you can expect to see full color photos of every design. 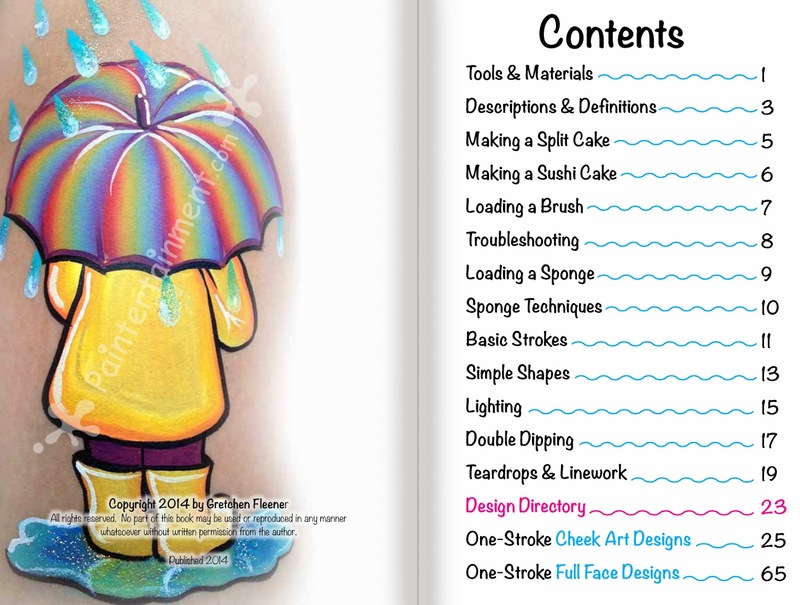 As you can see from the contents above, this book also touches on many other important topics like loading a brush/sponge, teardrops & linework, lighting, making split cakes, troubleshooting, and more. Click here to pre-order your copy today for $25.00! Okay, my clients are too "Minnesota nice" to have been quite that blunt on the phone, but I know that's what many potential clients are thinking! And I don't blame you. 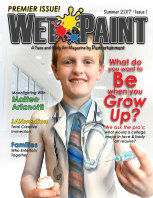 How and where would a mom planning a birthday party ever have picked up the knowledge of what professional face painters are worth? 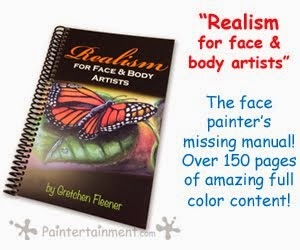 After all, aren't face painters just people who were born artistic, bought a set of paints, and started charging exorbitant amounts of money to take advantage of people who can't draw? Noooo!! I have wanted to post on this topic for years, but have been hesitant, and this is why. I do not want this to come across as me complaining..."woe is me...I have SO many expenses....you have no idea..." Running a business costs money, yes. And time...oh, the time. But, I love what I do! I am super excited every time I book an event. And I often have to hold myself back from purchasing too many awesome supplies to make your parties all that more AWESOME until I make the money to pay for it. The fact that I love what I do so much is probably one reason you don't know just how much work, time and money goes into this business...because I don't complain about that stuff. It's all worth it!! That being said, it does cost actual money to be a face painter, and the purpose of course of a business is to cover those costs and still make money when all is said and done. So, we do our best to weigh our costs and figure on a price that helps us to recoup our costs, and still have some profit left over to pay our own bills as well. 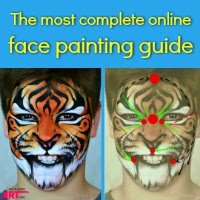 So, please read this through that lens, as my hopes is that this blog post will help people understand what they are really getting when they hire a face painter. Proving our value is a constant battle for face painters. 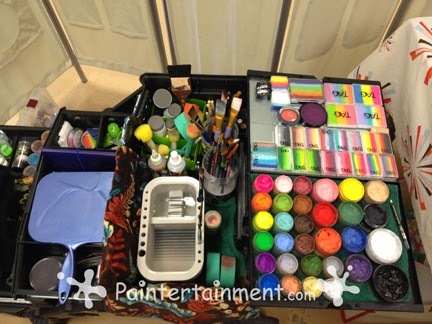 As professional face painters, we invest a lot...I mean a LOT of time and money into our tools and skills. It takes a lot of hard work and money to make money in this business and professional face painters probably deserve a little more credit than some people give them. Some people have a hard time paying for face painting because it washes off, and doesn't last forever. True, it washes off, but the fact that it doesn't last is not true. You are paying for an experience. You are paying for your kids' childhood memories of birthday parties or events, which they will have their whole life. Not to mention the fantastic photos you'll take. The clients whose baby bumps I paint get this concept really well! They do it for the experience, and the photos for their baby books. People don't complain that concert tickets are a rip off because they can't take the band members' guitars home with them, right? They pay for the experience! 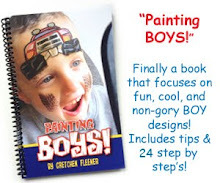 And please know that we as face painters are not just trying to take advantage of your desire to give your son or daughter a happy childhood by arbitrarily monetizing the experience. We actually do have real, physical costs involved with our job....we aren't just artistic people who show up with paint, work for an hour, and make a hundred bucks or whatever the going rate is. Behind the Scenes...1 Hour to You = 3.5 for Me. Paperwork...it adds up! 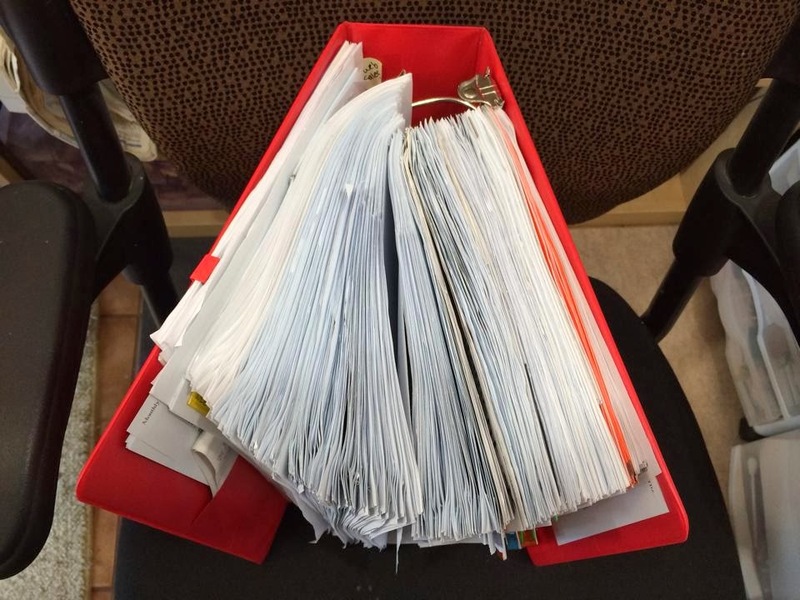 This is my overflowing 2013 binder of sales, invoices, contracts, and expense receipts! My Fatmax in the car...takes up the entire front seat! Once I reach our agreed upon end time, it's another 15 minutes to pack up my gear, say my goodbyes, collect payment, get back to the car, and load up my gear again...2.75 hours. The 30 minute drive home brings us up to a conservative estimated grand total of 3 hours and 15 minutes. This of course doesn't account for traffic, the party running late, extra guests arriving towards the end, etc. As you can see, once you take that $100 per hour for a party, and factor in the time spent, it comes to about $30 per hour if you are basing it purely on hourly wages. That's before taxes. And I also tithe 10% off the top first. I explain all of this only so that you will see that even though we may charge you $100 for "one hour of painting," we are actually working for you for over 3 hours. This is why many artists have at least a 2 hour minimum for their parties...to make all of that necessary time before and after painting worth their while. After all, this job does often require us to spend weekends, evenings, and even holidays away from our own families too. $30 per hour doesn't come close to covering all of the costs listed in this post, let alone give us a profit, unless we do a TON of one hour parties! So, I hope this helps you see that while our "hourly" quote for you may seem outlandish, it really is quite modest with all things considered. True, this may not be a hard cost to those who have natural talent, but it's actually one of the few major things that I think most clients already are aware of and willing to pay for. I can't tell you HOW many time's I've heard "Wow, Mommy can't come even anywhere CLOSE to that when she paints your face at home, can she?" or, "Wow, I can't even draw a stick person! You make it look so EASY!" And I'm not anything special...these are the things that professional face painters hear at every event...for a reason! There's a reason we hire specialized professionals, and I think most people get this. They know that while we make it LOOK easy, it's not something that anybody and everybody can do. Now don't get me wrong, there are plenty of face painters out there who do an amazing job face painting, who were not born particularly artistic. They work very hard to perfect their craft, if not harder than those for whom it comes naturally, and are very much worth hiring as well! But, to some degree, the level of in-born artistic skill is something that can affect an artist's hourly rate as well. Someone who has just started may charge much less. Someone who has been in the business for decades and painting since they were a child can probably fetch more, and probably spends more on things like training and insurance. These artists are perfectly comfortable coming up with designs on the fly, and painting special requests that they've never painted before. And that's worth a little something extra. 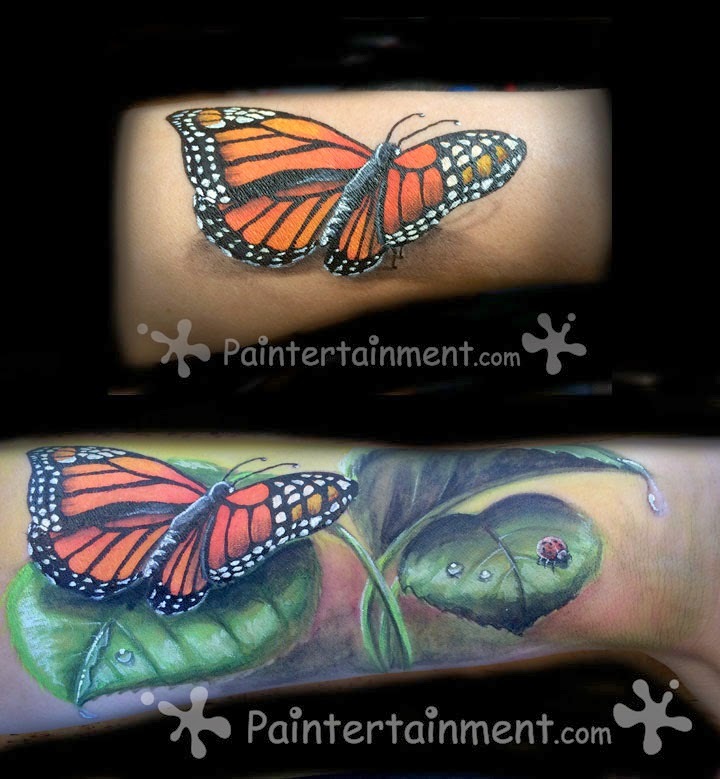 Many, many professional face painters spend a lot of time and money growing and perfecting their skills. Even the most amazing fine artist will find that there are certain skills associated with face painting specifically that they can work on. Setting aside the art, design, and business related college degrees that so many of us have invested in, did you know that there are huge conferences held all over the country and the world, multiple times per year? 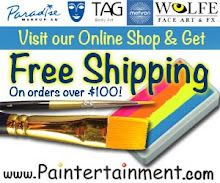 There's FABIAC, FPBAC, East and West coast conventions, global conventions... Professional painters spend money on airfare, hotels, food and conference fees to learn from the best and bring it back into your living room. They don't work for large corporations that fund their trips...they save their hard earned dollars from face painting to go learn more about face painting...because they love it so much!! 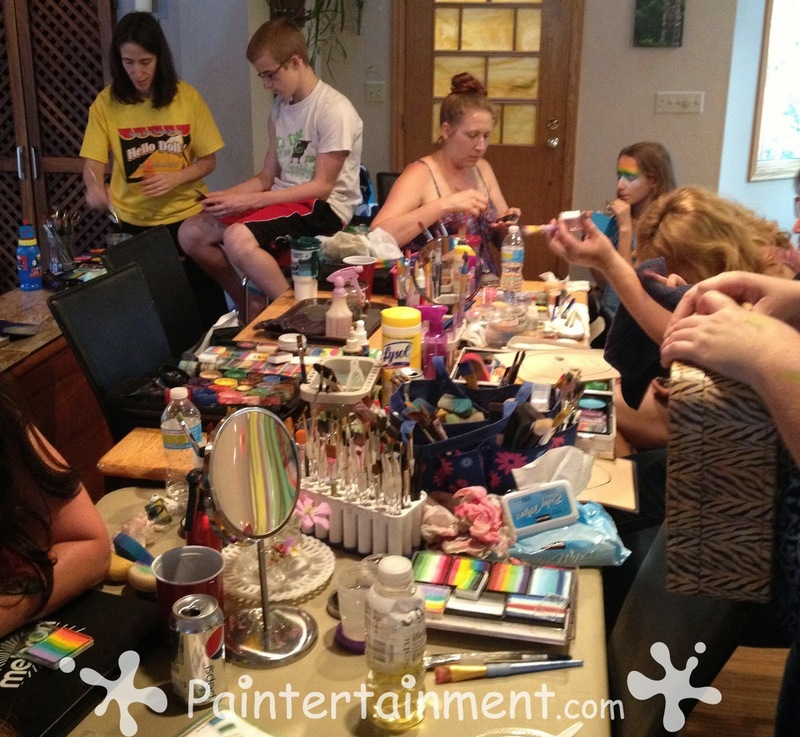 Another thing that many professional face painters do is they attend workshops and jams. 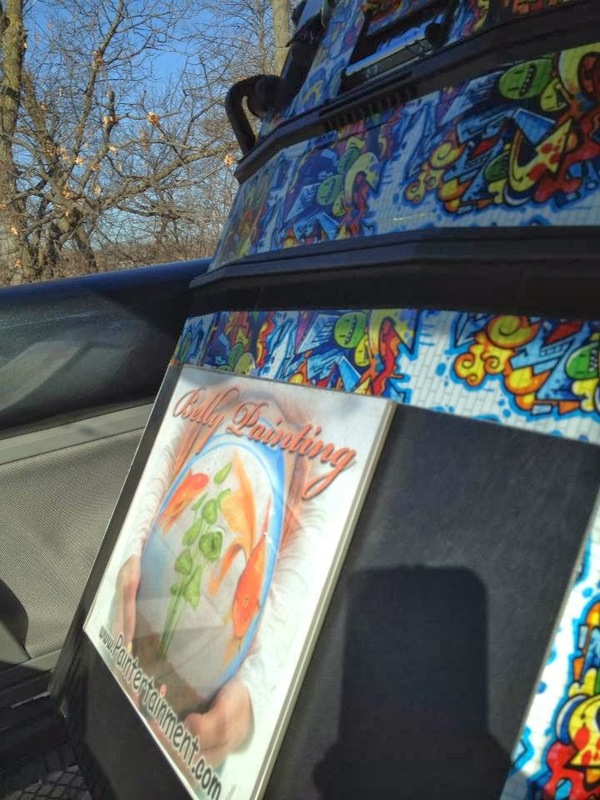 Many artists will drive for hours to neighboring states and pay hundreds of dollars to attend weekend workshops where other professionals teach. A jam held at my house last summer. A wonderful community of local artists, getting together at their own expense to share and learn from each other, to grow and improve the standards of our art in our area! Besides the expenses involved with traveling to learn, many artists also subscribe to magazines. Unfortunately there are currently no face and body art magazines that I know of available in the United States anymore, but there are several in Europe. I personally subscribe to Illusion magazine, which is published in the UK, and have had my work published in it as well. With shipping to the US, this magazine costs me $100 for a year, and that's only 4 issues. 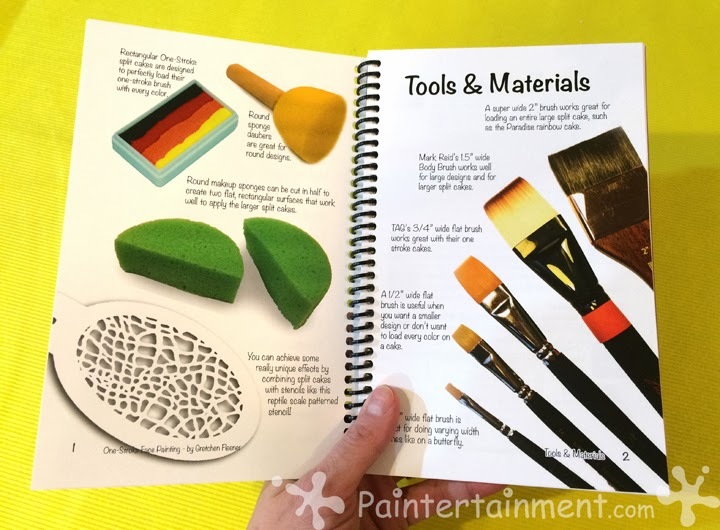 There are also many great books out there that artists invest in to learn new techniques! Many artists also subscribe to FABAtv, which is an online subscription service offering hours upon hours of videos of professional painters teaching. FABA TV costs $30.00 per month, or $289.00 for a year. Liability Insurance - I have a million dollar general liability policy. It is required by several of my clients, and covers all of my events in the event that something happens. I've never had to use it of course, yet I have carried insurance for the last 16 years that I've been in business. It's about $200 per year but varies on the company you use. Internet Costs - I pay about $120 per year to own my domain name and host my website. 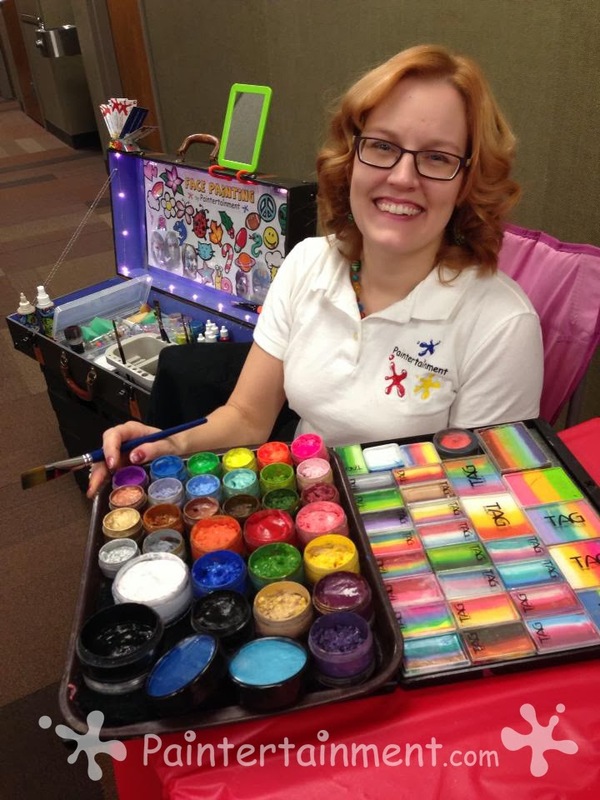 I have many additional costs just because I also run an online store, including payment processing fees, shopping cart button hosting, but those of course are not related to my face painting services so I won't get into that! Luckily my education in graphic design has afforded me the ability to design and maintain my own website, which would be a HUGE expense if I had to hire that out. Taxes - Yes, I pay taxes on all of my earnings, too. I've actually had a client expect to get me for half the price if they paid me in cash. Sorry, no can do...I am a legitimate, tax paying business. This is the hard costs that are the most obvious and easier to explain. However, the average person still isn't aware of what the tools of our trade cost. What we use does not compare to the cheap "Made in China" face paint sets you find in craft stores or in the Halloween section at Walmart. You'd have no reason to know this, and I certainly don't expect you to, so let me give you a little bit of an idea! Some artists start with palettes that include small amounts of many colors, similar to this one by Mehron, which costs $100 (plus shipping). More of the artists I know have at minimum a kit about this size which costs $135.00 and has larger cakes of paint. One cake of paint, one color, can cost anywhere from $7.00 to $20, depending on the brand and size. So, setting aside the size of each cake, the most basic set of paints you'd need red, orange, yellow, green, blue, purple, brown, black, white, and pink. That's a minimum of 10 cakes of paint, although most also purchase variations like light and dark versions of each color, neon colors, metallic makeups, etc...as well as one-stroke cakes which add up very quickly but give awesome results! I'd estimate that I probably carry in my most basic kit, anywhere from $300-$500 worth of supplies to a typical birthday party. However, my complete collection of supplies and tools that I store at home and draw from for events probably ranges in the thousands. My "FatMax"...at a public belly painting event. I probably brought over $1,000 worth of supplies to this event. Interested in booking me or one of my fantastic artists for your event, now that you know what a steal we are?! ;-) Check out my website here for more information!! 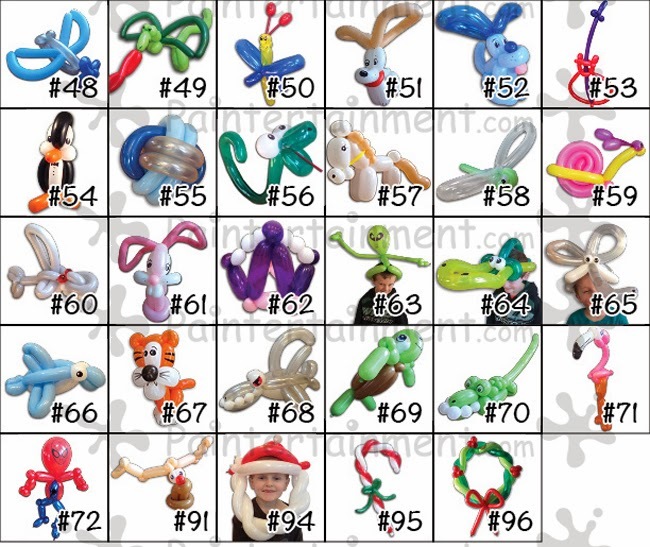 Now Available: Build-Your-Own Balloon Design Menu! I've been working on something for quite a while now, and felt that it was time to launch it! 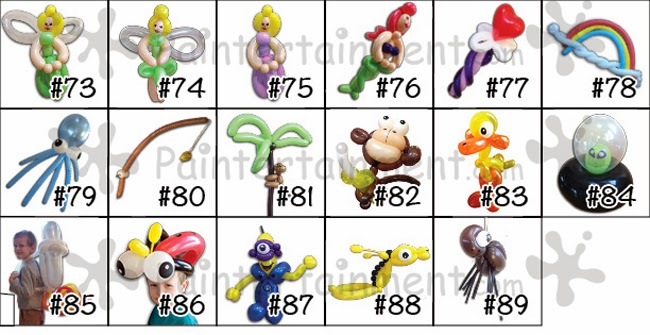 Are you a balloon twister? Have you struggled with finding a way to edit your photos so that the balloon is the only thing you see, without your living room in the background? 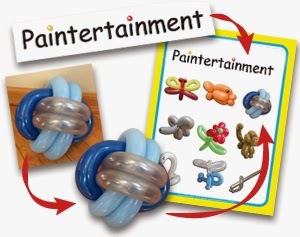 We now have the option to build your own balloon twisting design menu at Paintertainment! 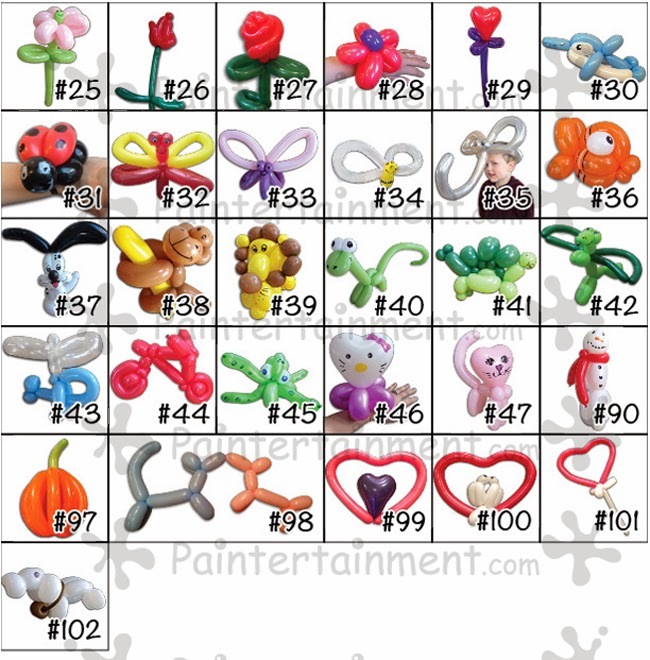 All you see are clean, clear, professional looking photos of balloons against a white background. You can now build your own design menu by choosing your size (letter or tabloid), orientation (landscape or portrait), and designs. For just $1.00 per design, I will then lay out a digital file for you, email it to you, and you can print it or have it printed and laminated or framed as you wish! Not finding everything you'd like in our stock image selection? No problem! 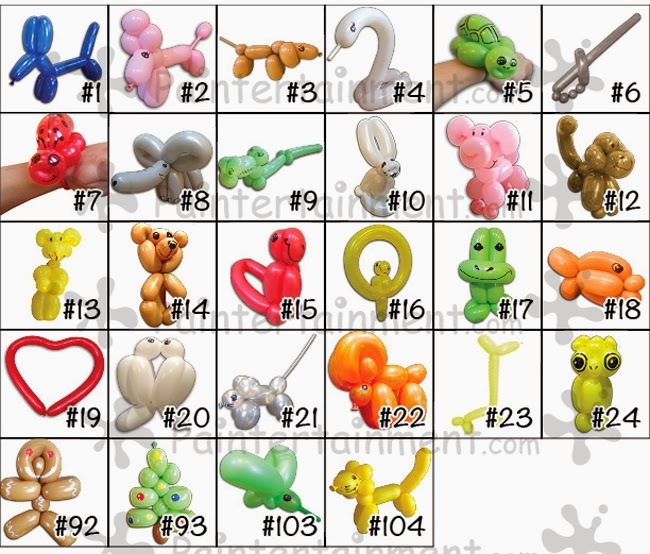 You are now able to basically hire a designer (that would be me) for just $5.00 per image to edit photos of your own balloon creations. Just email us the photos, and we'll do the rest! 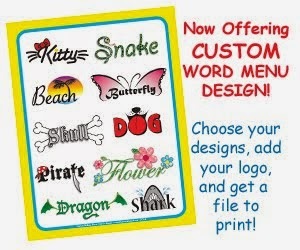 You can also send us your business logo or text for $3.00 if you'd like to include that as well! I am constantly working on new designs, and whenever I have more I will be updating this selection. So, be sure to keep checking back at the site for new additions!